Collaboration with Valerio, since I've used the settings of his stories for the most part. This story series I’m planning on doing is militaristic in nature focusing on sniping and therefore WILL include weapons use mainly for training purposes(yeah, OK, I lied initially), a little blood (upped the rating, ended up with more blood than initially planned, but still not too graphic), and semi-harsh language (I’ve kept the language censored or PG, darn, heck, etc.). Reader discretion is advised. “It’s time to get what’s coming to you,” the man said in a sinister voice. “No! Not that … NOOOO!” screamed the wolf as the man carried him into the other room and dropped him with a splash. Some of the tub’s water was sent over the edge and onto the floor. “Aaaack! Let me out, Keith!” the wolf called out while being attacked by fingertips and shampoo. “Light! You’re getting a bath, whether you like it or not,” Keith replied while washing the wolf. Keith didn’t know why getting a bath was such a big deal. He, himself, bathed once a day. He also didn’t know why he’d taken such a liking to what many considered a very dangerous creature. 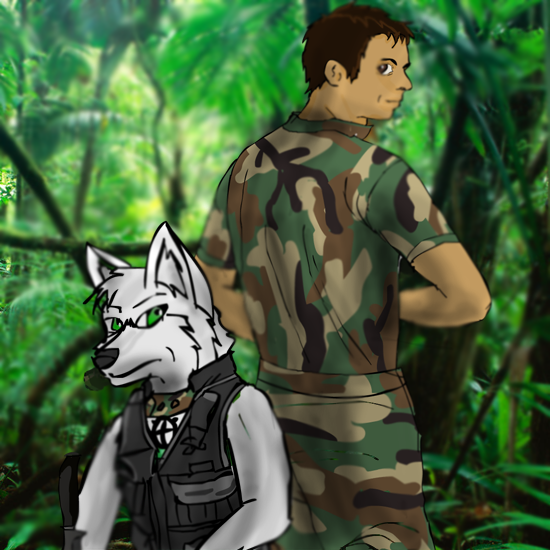 On one of his missions, he’d come across the wolf, near its end, suffering from a bullet wound. It was amazing he was able to see it at all, the pure white wolf against the pure white snow. Ironic, he thought. The only reason he’d seen it was because of the blood. Using his basic military knowledge of first aid he’d miraculously managed to save its life. He would only find out later, the implications of such an action. A knock at the door interrupted his thoughts. “Just a minute!” he called out towards the front door. “Good boy.” Keith said while closing the bathroom door. He walked to the front door and looking through the peephole saw a man in a military police uniform. “Can I help you sir? !” Keith shouted through the door. He sighed. He’d retired … before, and it seemed to be getting more and more difficult to stay that way. He unbolted the door and opened it, staring at the uniformed man’s eyes. For some reason the man couldn’t return the stare. “Here is the paperwork I’m supposed to deliver, Sir.” he smirked, handing over the envelope. “You have a little something…” he said indicating to his face. Keith felt around his face and found the lathered shampoo on his cheek. “Oh.” he replied looking at it. The MP gave a salute, and was lazily returned one by Keith, after which he turned quickly and walked down the stairs of the apartment complex. Keith closed the door behind him and walked into the living room looking at the envelope. Just then, Light walked in picking at his ear with the tip of a bath towel. “Who was that?” he asked. Light took the envelope and opened it. “What do you mean, by th-“ but by the time he realized it, it was too late and Keith had begun tickling him and he continued until he was barely able to breathe. “Ahahaha … ha … I wish …heehee … I wish, you’d …. hah … take this … heh … more seriously.” He said between breaths. “Haha, who’s high and mighty now.” Keith responded from the kitchen, making a couple of PB&J sandwiches for the two of them. He was actually a little jealous of the wolf’s ability to see very well at night. When he returned to the living room, the wolf was sitting on the armchair. The wolf hesitantly got to the floor and sat on the rug, munching the sandwich his master had handed him. Master was the correct term, wasn’t it? Light knew about humans and the pets they usually adopted; but their situation was … different. When he’d first met the dying wolf, Keith approached cautiously, knowing that the wolf would not be very trusting to someone dressed very strangely with a rifle slung over their shoulder considering it had just been shot. “Do you need help?” Keith asked. “No. I don’t shoot animals.” he said with a sincere face. “Then what’s that for?” he asked weakly, gesturing towards the rifle. “Heh, is that so?” he paused a moment, trying to think of what this man could have meant by that. He didn’t like the idea of being indebted to a human, but it seemed like he didn’t have much of a choice at this point. “Alright, help me.” the wolf said in a soft voice, wincing. Keith cautiously approached the wolf, the snow crunching beneath his feet. He knelt beside him, being careful not to get any blood on his clothing, got out a first aid kit and went to work. He didn’t know it at the time, but in saving the wolf’s life, the wolf was obligated to return the favor. It was a law growing up in his pack, to owe one’s life to someone that saved yours. After he’d patched the wolf up, as best as he could, he carefully lifted the wolf off the ground; he seemed so light. “I haven’t picked it yet.” the wolf replied. “Well, that’s a strange name.” the man said smiling. “Are you serious? !” the wolf gasped. Wincing from the pain. The wolf rolled his eyes. “No good, huh? Well, how does ‘Light,’ sound?” the man asked, thinking back to the moment he picked up the wolf off the snow. The wolf didn’t say anything. Keith looked down. His eyes were closed. Keith was worried for a second but calmed down when he felt the wolf breathing on his hand. “Alright, get some rest, Light.” he whispered. “Sorry, we were out of the grape jelly. I could only find strawberry.” He handed Light a glass of water, then picked up the envelope’s contents and read them out loud, for Light’s sake.
" "Hey that's nearby!" Light interrupted. Keith cleared his throat and continued. My name is Martin Foster, but please, call me Martin. I am in need of military services. I am the new manager and owner of the Lucky Charm Grove for the Abandoned and the Ferals located in Babylon Gardens and I feel the police forces are inadequate to ensure the safety of the wonderful pets that reside here, and future abandoned animals that may need to reside at my shelter. Please send your top sniper to meet with me so that we may discuss business. I have requested that this letter be unreadable to a house pets eyes, because I wish this information not be known to them as to prevent inciting fear and/or possible breaches of security. As we cannot offer military services to a civilian or private company, we have responded to his letter with the proposal of registering through Retired Marine Mercenary Services (RMMS), which have instructed us to forward Mr. Foster’s letter to you. Please contact Mr. Foster with your response at M.Foster@LCG.com as per RMMS’ instructions. “They really wrote a novel there, didn’t they?” Light said, after swallowing the last of his sandwich. “Well, what do you want to do?” Light continued. Light reflected on the training he went through as a military dog under Keith’s care. He had learned nearly every element of sniping from him, apart from actually firing the weapons, and much of it under the radar of the higher-ups, when they were still in the marines. Since their team had proven effective many times, Keith was finally able to get him a military working dog position, as a spotter, in a human/canine sniper team, the first of its kind. Light remembered something he’d heard Keith say. “Well, looks like Martin’s done his homework,” Light said with a smile. “RMMS must have sent him my address. Well if he knows me as well as I think he does, even after leaving me this note, he should still be expecting me, whether I respond or not. But, what he won’t be expecting … is you” He said, patting Light on the shoulder. They continued through the apartment complex to the parking lot and got into Keith’s Honda Civic. (What? You were expecting a Ferrari?) Certainly, if you wanted to hide a needle in a needle stack, such a simple car would do the trick. Light instinctively scanned the interior, taking notice of the locations of the vehicle’s vital components. “Nah, don’t worry about it. It’s only natural. But please, try to relax for now.” He started up the car and began the drive towards Babylon Gardens. This is my first piece of fan-fiction, so please be nice. At the same time, I'd appreciate some constructive criticism. Thanks again to Rick Griffin for Housepets! and Valerio, for letting me use some of his characters and his collaboration. Don't worry. I do plan on having some of the characters from Housepets! in this series. Last edited by lightwolf21 on Thu Sep 13, 2012 3:35 pm, edited 22 times in total. I bless your effort, my brave one, and hope to see more soon! Sorry for the long wait. I was studying for a final. Finally we see some Housepets! characters. Housepets! and characters belong to Rick Griffin. Alcor, Mizar, and Martin belong to Valerio. Keith and Light belong to me (Lightwolf21). “The following takes place between 3 pm and 4 pm.” The white wolf sighed, he was watching an old episode of 24 on the screen of the Smartphone he was holding, wondering if they would ever try to get the facts straight in ‘Hollywood’ productions. He closed the media player and started up the browser, and searched for his favorite web comic. He typed in T, and ‘The Adventures of Spot (Superdog)’, appeared in the search field. Light was trying not to laugh at the web comic. He always got a kick out of reading it. As they got off the interstate and approached Babylon Gardens he looked up and his eyes widened. It was a beautiful, seemingly quiet neighborhood. For Light, who had never been in such a pet friendly neighborhood, there seemed to be dogs and cats everywhere. His eyes were drawn to a particularly strange-colored cat with a fish shaped tag walking beside a dog with a bone shaped one. They seemed closer than he had heard cats and dogs usually were around one another. “Thank you, I’ve got it,” Keith said, ending the call. A few moments later he pulled up to a house, well, it might have been a house, but it was bigger than any house Light had seen. “Here we are,” Keith said to Light. “Man, this place is huge!” Light exclaimed. “This is Martin Foster’s place, apparently.” Keith could tell this Mr. Foster, seemed to have a lot of money. He could hire anyone he wants, so why hire someone from RMMS? He suddenly became conscious of what he was wearing, jeans and an untucked short-sleeve button down shirt with sneakers. He started to feel he wasn’t dressed nice enough. “Ok, so what did you want me to do?” Light asked. Keith, returning to his senses, turned to the wolf. “Well, it’s a bit hot out for you to stay in the car without AC. And I’m not leaving the car running. Did you want to come inside with me? “But, what if someone sees me? We’re in suburbia and I’m a wolf. There’s bound to be some trouble.” A pack of gray colored wolves walked by the car, smiling and waving to some of the neighborhood pets. “You were saying?” Keith responded. They walked up the path, Light being careful not to make eye contact with anyone. Light felt like everyone on the street in front of the house was staring at them, and they were. They’d never seen a human with a pet wolf before. Keith gave a knock on the door and anxiously looked around. “Yes?” came a voice on the intercom beside it. “Who sends a message with animal proof inking?” the Lieutenant responded. Keith tried the door and found it was unlocked. He looked at the wolf and the wolf just shrugged. “They must not worry much about security.” He said, entering the building followed by Keith. As they entered the house they were greeted by a male cat and a female German shepherd wearing black collars that sharply contrasted with their pure white fur. From each of the collars hung a white sphere that glistened in the sunlight coming from the windows that adorned the room. “Hello,” Keith said. Light was standing behind Keith and peering around his legs looking at the pets. “Light, don’t be rude.” He continued stepping aside. “Um … hi,” Light finally said. “Wait a minute,” the wolf said, “you call him your dad?” Light had never considered Keith to be a dad to him. “Sorry, about that,” Keith said glaring at Light. “My name is Keith Greyfield and this is my wolf, Light... I take it it’s not common for a human to have a pet wolf?” Keith asked, pretty sure that was the cause of the stares from the streets outside the door." Alcor and Mizar left the room after they’d said their goodbyes. “Mr. Foster,” Keith said, offering his hand. “Is that an order sir?” Keith asked with a sarcastic grin. Martin chuckled. “So, is this the famous Light?” he asked, indicating the wolf. Light was nervous beyond reproach, but he didn’t want to disappoint Keith so he hesitantly walked towards Martin and offered him his head. Martin must have been a genius to find his favorite spot to be scratched on the first try. The wolf was in heaven. “If you asked for us, personally … then … but how did you hear about us?” Light asked. “Please, we have much to discuss and little time.” He gestured for them to follow him. They all felt the house shaking and heard loud footsteps running. Once again, please let me know if corrections need to be made. Thank you. Last edited by lightwolf21 on Thu May 26, 2011 2:52 pm, edited 6 times in total. I wonder who's doing that noise! I'm too busy feeling all warm and fuzzy inside! It took a little longer than I thought it would. Please enjoy. “What’s that?” Light asked, with a surprised look on his face. “Ah those would be my puppies.” Martin barely finished the sentence when they came storming into the kitchen. Two giants, of short black fur, a hint of red in the chest areas, with wolf shaped muzzles, pointed ears and bobtails, came to a screeching halt in front of Martin. “This is Antares and Aldebaran.” He indicated first to the huge black dog with a sparkling red sphere hanging from his collar and then the one with the orange sphere. The dogs were effortlessly holding huge luggage bags over their shoulders. Keith and Light were astounded. Regaining their composure, Keith and Light shook hands with Aldebaran and Antares. After which, the two behemoths continued through the house back towards the garage, at a breakneck speed. “It looks like you’re going somewhere,” Keith said, pointing his thumb over his shoulder, indicating the luggage. “I’m not really dressed for a job interview.” Keith responded looking at Light, Light returned the look and turned back towards Martin. Suddenly the fridge door shut in the kitchen and a German shepherd walked in carrying a tray full of food, but this one was different from the pure white Mizar. The brown muzzle and ears of the cream colored dog was complimented by bright pink eyes and a matching pink collar from which a heart shaped tag was hanging. “Hello there,” she said in an unnaturally cheerful voice. “Pleased to meet you Sasha,” Keith said scratching her head gently. Sasha set down the tray and took a seat near Light looking straight at him, causing him to fidget. With a nervous smile Light extended a paw to Sasha for a handshake … but she grasped it with both of her paws. “You’re kind of cute,” she said. No amount of military training could have prepared Light for this moment. He was at a loss for words. He didn’t know how to handle this situation, something he never thought possible. In desperation, he scooted the chair a bit down the table closer to Keith and Martin. Sasha followed suit. Martin and Keith were amused, smiling as Light squirmed. “Sasha?” called a voice from the other room. In walked a dog, he was wearing a green collar, a blue lightweight Kevlar vest with K-9 embroidered on it, and sunglasses that covered the darker colored patch of fur over his right eye. “There you are.” he said, stopping as he noticed Light holding her paws. Light noticed Sasha still gripping his paw. “Look, Fido, I wasn’t trying anything,” he said pulling his paw away from Sasha’s. She went to hug Fido, which Fido returned. Fido ended the hug and said to Sasha, “Dad needs us home soon, ok?” Sasha nodded and walked out of the room with an enthusiastic wave goodbye. As soon as Light took his paw, there came a loud voice from the top of Fido’s head. “Who’s the new guy?” A mouse popped out of Fido’s hair. At this point nothing could surprise Light anymore. Fido turned his eyes upward and said, “Spo, keep it down.” and then to Light, “Sorry about that. This is Spo. I’m watching over him at the request of my girlfriend.” Fido was taking a gamble. If Light had asked too many questions about his girlfriend, he might be forced to answer them truthfully. At this point, the wolf seemed harmless enough, and there weren’t many other believable explanations as to why a dog would have a mouse on the top of their head. “Who? Sasha? She’s not my girlfriend.” He’d realized his mistake too late; he could have ended the conversation at that. Fortunately, it seemed the wolf was just relieved he hadn’t caused any trouble. “Ok, well … at least I dodged a bullet there.” Light said rubbing the back of his neck. Keith and Martin were still staring and smiling. “Is he always this entertaining?” Martin asked. “Martin has an open door policy towards all the pets in the neighborhood, and the ferals as well, despite the police department’s warnings.” Fido said, hoping to carry the conversation farther from the subject of his girlfriend that might have still been lingering in Light’s mind. It was Martin’s open door policy to ferals that had caused the series of events...well, sort of. Three terrible dogs, the last living remnants of the memory of the Whiteman house, had murdered the two feral raccoons, Zen and Silver, which usually went to Martin’s house early in the morning to get the garbage, as per their agreement. Using Zachary’s new felt responsibility as ‘The Opener of Ways,’ the dogs caused him to leave his house during the lockdown in search of their kits. This lead to Zach becoming a hostage in an attempt to access and attack the animals at the shelter, and ultimately causing the insanity that he was now experiencing from the trauma of the ordeal. The Sandwich household was attacked causing widespread trauma and Peanut being put into a coma. The third dog had lured their ultimate prey, Martin, into a one on one, causing the near loss of his left arm, which thankfully now rested bandaged in a sling across his chest. They had used the series of events in an attempt to attack Martin where it counted most. But now, they were dead. They had failed, but the neighborhood did not come out unscathed. Martin kept his open door policy, hoping to ease the fears of others in the neighborhood. The Whiteman house’s legacy had ended with that last dog and with it so did the danger… at least for the time being. Keith and Light looked at each other. “The shelter, you mean?” Keith asked casually, turning to Martin. “What about the job interview?” Light asked. “We can continue that on the way, or during the tour at the shelter.” Martin responded. “Sure, no problem,” Keith said, nodding in agreement. “Ah, Fido, one more thing,” Martin said, turning to the policedog. While I’m gone, are you going to be watching the house with Bino; I understand he also invited Fox, Rex and, Sasha.” Fido nodded. “Would you mind telling him I will be having King stay here as well?” Martin continued. “Excellent.” Martin said getting up from the table. Keith and Light got up as well and followed Martin who had walked out the front door and towards the car. Fido waved after them as they left. He didn’t want to scare Light and Keith with the harrowing tale of the neighborhood’s nightmare, but he also had the feeling they’d been in similar situations. He decided it would be best not to take any more of Mr. Foster’s time, either. He knew that Martin was leaving the next morning with the Sandwiches and that they’d have little time to tour the shelter. “Do you need help, getting into the car Mr. Fos-“ Keith was trying to ask. “Please, there’s no need to be so formal all the time.” Martin interrupted opening the door and getting into the passenger seat. To which Light nodded, and took the keys offered to him. “No, not at all. This should be interesting.” Martin responded, with his usual infectious smile. Keith got into the car and sat in the seat behind Light. Light strapped in, along with the passengers, and adjusted the seat forward and the mirrors accordingly. Starting up the car, he looked over his shoulder to make sure no traffic was coming, pulled away from the curb, and started towards the shelter following the directions Martin gave from the passenger seat. Last edited by lightwolf21 on Fri Nov 12, 2010 6:24 pm, edited 3 times in total. I know this is kind of outside the willing suspension of disbelief (not to mention probably illegal in the Housepets! universe). I'll try to come up with a reasonable explanation or consequence at the beginning of the next chapter. But for now, lunch time, followed by homework. Huh, dont see that everyday. haha. Why in fanfics Peanut ALWAYS gets hurt somehow? Makes me sad alot. Well, in my own defense, I'll just say that it was exceptional circumstances. But things in my ficcie are going quite well for him AND Grape. EDIT: I haz a spoiler warning...Daww! Ah Sasha, Do you have to flirt with EVERYDOG/dog like animal you meet? haha. Now people who want to read my fanfic, will have to read 100 times more material than they were originally planning. Mwahaha! She's just kind of like that. She likes to spread happiness wherever she goes. And if that means complimenting others and being overly friendly, then so be it. Last edited by lightwolf21 on Sat Sep 04, 2010 6:02 pm, edited 2 times in total. I tried reading (her?) fanfics before... I got lost. But thanks to people like Sinder, i am now a Grapenut fan. CURSE YOU SINDER/TWO_TWIG! EDIT: Then again, i dont need to curse you. But that one fanfic... er Starlight something made me become a fan, and Syth in Periwinkle. Hehe, I started writing after reading their inspiring work! Many shippers owe a LOT to them two folks! But my fav fanfic ever currently is "A Whole new World" By Neko. And i Dont HATE KingXSasha shippers, i just think its VERY, VERY weird. Read my sig why. BTW can i use your Peanut and Grape sig in mine? I was inspired by Valerio, and therefore, by proxy, Sinder and Two_Twig. Figures. I would write one, but i would get writers block, and/or be afraid of people saying how much i fail at it. Nahh, if you like your idea, it'll come that natural, you'll see. And in this forum we NEVER judged anyone's work. Heh, we also have a masterpiece such as THE WORST HOUSEPETS FANFICTION EVER! You can't fail. But yeah, Can i use your PB&G one though? Of course you can use that userbar. If you check for the topics in the 'The comic' forum, you'll find one entitled 'User bars' with a wide choice of them! Can you provide a direct link? I tried searching, but it only linked to here... Sorry if it is causing you trouble. Aw, dont worry brawl, i read you're "Matches" Stuff. dont worry. Though I'm glad you have read that. And i liked it i guess, even though i am not a fan of the King of Hearts crap. I don't ship them, either, I'm just writing for writing's sake. WELL WHY WOULDKING BLUSH THEN HMMMMMMMM? sorry for the caps, but i mean really. Dont see alot of fics about that... Then again, theres not alot of Peanut+Tarot or Grape+Max, even though the comic so far is going that way. I'm just going to say this now: highlight the entire post. Highlight my entire post, as in, drag your mouse over all of the text to create that blue bar that overlaps it. If your idea was to make me feel retarded, it worked. No, it wasn't. It was more of a desire to be unexpected, which also worked.